The HP StoreOnce deduplication systems are a great fit for many different data management requirements, for example, data archiving. HP StoreOnce is available ranging from HP StoreOnce VSA (Virtual Storage Appliance) for small remote or branch offices, to physical appliances for the largest enterprises, and has been a popular storage choice among Veeam customers. Our support for HP StoreOnce Catalyst adds native integration with these systems for a number of benefits resulting in faster backup and recovery performance, and reduced bandwidth consumption. For more information, see our earlier blog post here. 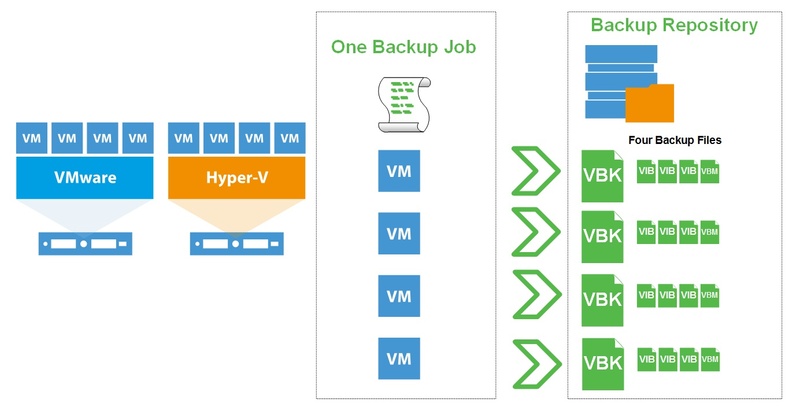 In Veeam Backup & Replication v8, Veeam introduced native support for EMC Data Domain via Data Domain Boost to improve the backup and recovery performance. v9 brings updated integration feature EMC Data Domain Boost 3.0 SDK. This enables DD OS 5.6 support, as well as support for source-side deduplication and data in-flight encryption over the WAN (wide area network) for faster, more secure backups to off-site EMC Data Domain deduplicating storage systems. If you are using an ExaGrid, Quantum appliance or Windows Server’s built-in deduplication, there is something everyone in v9. The following new features allow a number of improvements with any deduplication system. Additionally, we can improve local backup copy performance and reduce the load on deduplication appliances with the new option for active Grandfather-Father-Son (GFS) full backups in Backup Copy jobs. The data rehydration requirement is eliminated on the deduplication appliance with this option enabled — and instead, the entire restore point is copied over from source backup files. This effectively turns the Backup Copy workload from random to streaming, really broadening our support for the deduplication appliance that can serve as the target for Backup Copy jobs to any storage at all. Finally, we are adding a number of under the hood optimizations to help improve Instant VM Recovery, file-level and application-item recovery performance for most duplicating storage. While for optimal performance, we continue to recommend following our reference architecture whenever possible, these improvements will come handy in certain recovery scenarios – for example, recovery from off-site backup repository, where deduplicating storage is commonly found – and bring noticeable improvement to recovery experience. Other recovery types requiring random I/O, including file-level recovery as well as Veeam Explorers for Active Directory, SQL Server, SharePoint, Exchange, and Oracle also show noticeable performance improvement, letting you perform granular recoveries faster than before. Personally, I feel these new integrations will really allow companies to get the most out of their deduplication investment. There are always challenges with deduplication when it comes to getting the most performance coupled with the best overall deduplication rates, and these new integrations really help to address these challenges. For more information on this exciting new feature visit our Veeam Availability Suite v9 page. Register for an upcoming webinar on New Storage Integrations in Veeam Availability Suite v9.